ReMPEG2 is a program to transcode an MPEG-2 video file to half D1 resolution (352x480 for NTSC, 352x576 for PAL) or SVCD resolution (480x480 for NTSC, 480x576 for PAL). Alternatively, it can keep the resolution and just lower the bitrate. Until now the original MPEG-2 video file had to be decoded into an AVI file (or similar) in the first step and then reencoded to MPEG. no characteristics of the input file can be exploited since they are all lost when converting to AVI. This leads to loosing a/v sync for NTSC videos in some cases as well as the need for the encoder to examine the video to detect scene changes etc. for optimal performance. ReMPEG2 is a combined decoder/encoder which avoids these problems by preserving the sequence of picture types (IPB) and trying to follow the original stream's bitrate flow. 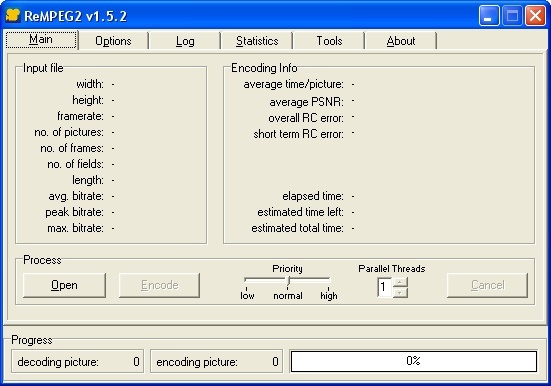 This means that the user can choose a bitrate scaling factor which is used to calculate the number of bits available for each encoded picture from the number of bits in the corresponding input picture.